A graduate of the Yehudi Menuhin School (England), she has performed as a soloist with many world renowned orchestras including London Symphony and Tokyo Symphony. 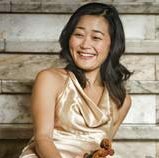 Natsuko performed with the Melbourne Symphony Orchestra in July 2009 and with Iwaki Kanazawa’s wife, Kaori Kimura in 2010. She is currently Heidelberg Symphony’s “Soloist in Residence”.